342 pages | 15 B/W Illus. 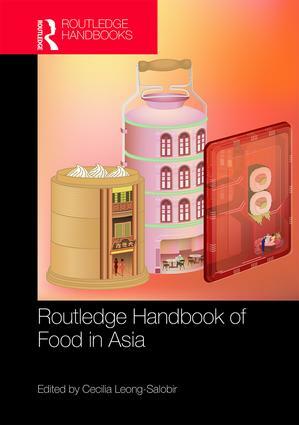 Throwing new light on how colonisation and globalization have affected the food practices of different communities in Asia, the Routledge Handbook of Food in Asia explores the changes and variations in the region’s dishes, meals and ways of eating. Interdisciplinary in nature, this handbook is a useful reference guide for students and scholars of anthropology, sociology and world history, in addition to food history, cultural studies and Asian studies in general. Cecilia Leong-Salobir is a food historian affiliated with the University of Wollongong and University of Western Australia. Her publications include Food Culture in Colonial Asia: A Taste of Empire and Urban Food Culture: Sydney, Shanghai and Singapore in the Twentieth Century. Cecilia serves on editorial advisory boards for Global Food History and Food, Culture & Society.